Various meanings of this card: You and your loved ones will be protected and provided for. Let go of any “bag-lady” fears about your future. Hold positive thoughts and intentions. Know that you will always have your needs met, now and in the future. Don’t worry about money, but instead, visualize abundance. As I have often mentioned, when I start to worry about something in my life, I now catch myself and try to turn it around as quickly as possible. I work really hard to release negative thinking and turn instead to positive affirmations and I have found over the last few months that like anything else in life, I am getting way better at it with some practice! It used to feel like there was a tape running over an over in my head of worry… what if’s played strongly upon my imagination… what if’s that take up residence in your head and sneak innocuously into every thought you have, paralyzing you with fear on a daily basis. Letting all that go is so freeing, so empowering and so necessary to see growth and fulfillment in your life. Again, one of my very favourite sayings in this world is “worrying is like praying for what you don’t want”, so make sure you turn it around and start praying for guidance to help you acheive what you DO want! 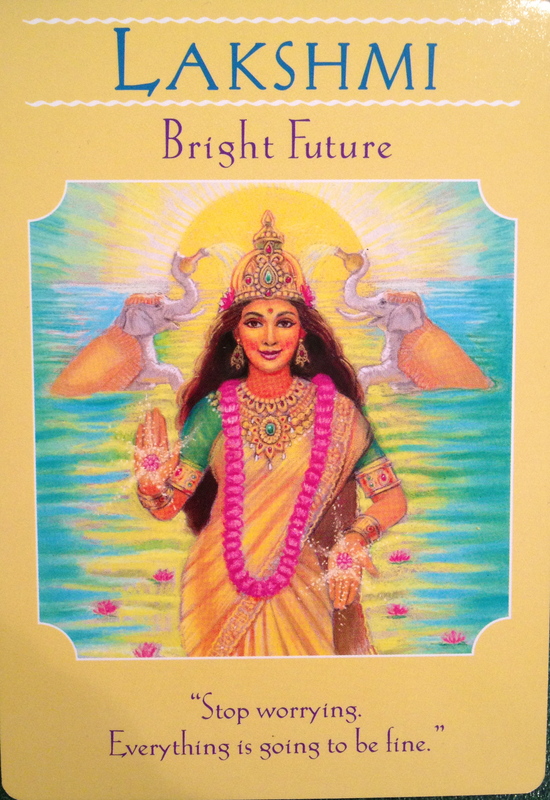 So today Lakshmi is telling us to let go of our fears and trust that the future is looking bright. All our hard work is paying off, we are manifesting our dreams and all we need to do is keep positive and let the abundance come to us. Sounds good to me!